An introduction to dance and gymnastics for the young child, presented in an imaginative, creative, and fun-filled way. -Students must turn 3 and be out of diapers before beginning classes; No exceptions! 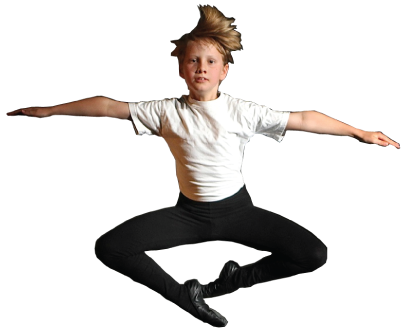 The classic form of dance which builds grace, beauty, poise and strength while developing correct body placement and enhancing a sense of artistry in children and adults. POINTE REQUIREMENT: Pointe students MUST also enroll in at least 2 additional Ballet Technique classes. The dance of today that combines the arts of Ballet, Modern, Afro and current dance trends to create a free style technique of movement unlimited in expression. A dance form indigenous to America, now enjoying its greatest revival! Tap dance is characterized by using the sounds of tap shoes striking the floor as a form of percussion. A broad collection of urban street dance styles! Contemporary: A fusion of modern techniques & numerous styles of dance, challenging students with new and unique ways of moving. Lyrical: A dance that combines many technical elements of ballet with the freedom, fluidity and expressiveness of jazz. It is expressive, subtle and dynamic and focused on conveying musicality and emotion through movements. Modern:A style that centers on a dancer’s own interpretations instead of structured steps. Modern dancers are encouraged to use their emotions and moods to design their own steps and routines. Turns & Jumps:A strictly technique class that focuses on strengthening and improving Turns and Jumps for dancers. Become your favorite princess through the mediums of music and dance. Dancers will learn songs and a variety of dance styles including Ballet, Jazz, Tap, and more. This enchanting camp also includes theme-based crafts, movies, storybooks, and more. Dance & sing into the musicals of Mary Poppins with the new and legendary soundtracks. Dancers will learn technique and choreography in a variety of dance styles including Ballet, Jazz, Tap, and more. This fun Musical Theatre camp will include theme-based crafts, movie excerpts, drama games, and more. Develop versatility of movement and a greater breadth of expression and performance through the multiple styles of Jazz, Hip hop, Contemporary, Musical Theatre, Lyrical, and more. Improve your ballet and pointe technique and explore other dance forms every ballet dancer needs to know. Additional fees will be applied to classes that are 1:15 ($6) or 1:30 ($12). Please Note: Discounts will only apply to individual students taking multiple classes and additional family members who enroll for the same number of weeks. If family members are taking different number of weeks, they will be charged on an individual pricing basis. Please see the Summer 2019 Handbook for additional information. A dance form indigenous to America, now enjoying its greatest revival; fun for children and adults! Modern: A style that centers on a dancer’s own interpretations instead of structured steps. Modern dancers are encouraged to use their emotions and moods to design their own steps and routines. Plus: Turns & Jumps and Special Needs. Introducing young children to dance in an imaginative, creative, and fun-filled way! Students must have had their 3rd birthday & be out of diapers to enroll in class; no exceptions! Additional fees will be applied to classes that are 1:15 hrs ($6), or 1:30 hrs ($12). A $10.00 late fee will be applied if tuition is not paid within 14 days of the due date. If past due tuition has not been paid by the start of the next pay period, an additional $15.00 billing fee will be applied. A 2-week notice, prior to the start of the pay period, is required when dropping from a class. Students who drop (stop attending class) without notifying the studio office are responsible for all tuition charges incurred, regardless of attendance, until the studio office is notified.